Bostik, a leading global adhesive specialist in construction, consumer and industrial markets, has been observing prosperous growth in India for the past few years. In 2018, the company started a new plant in Gujarat to meet the increasing demand for adhesives in the industrial markets of India and South Asia. The new facility currently applies the latest manufacturing techniques to produce liquid adhesives for flexible lamination and footwear. It’s Bostik’s third plant in India with two other plants in Bangalore. In addition, the company has 15 warehouses and four sales offices with its headquarters in Bangalore. Bostik started its operation in India in 1992 through an agreement between Coates India and Bostik UK. However, Bostik India separated from Coates in 2001 to become an entity by itself. “When we started in India, we were very small. But the market was huge, and that was a big advantage for us,” said Ganeshan MV, managing director at Bostik India. Recently, the company invested in state-of -art equipment to produce advanced hot melt pressure sensitive adhesives (HMPSA) for a range of industrial sectors including for tapes and labels, transportation and footwear production. “Bostik’s strategy is to invest in key technologies and emerging countries. Hence, investing in India is inline with our our strategic agenda and we are trying to grow our business in India,” he said. 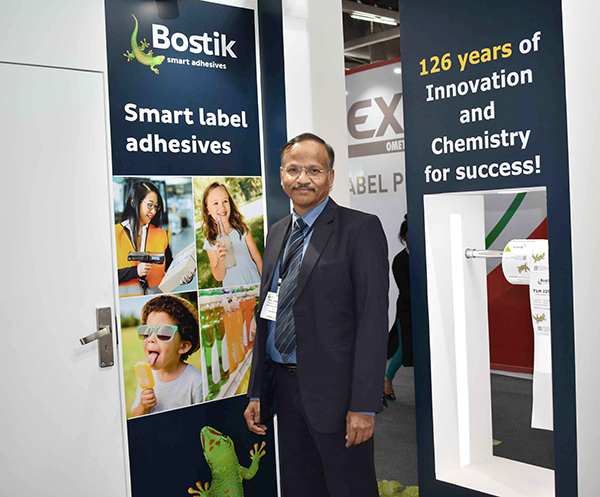 Bostik participated in the Labelexpo India 2018 exhibition where it showcased an extended range of adhesive technology and applications, including smart adhesives for label applications like difficult substrates. “The Labelexpo India event has given us a very good interface to communicate with customer and other stakeholders. It is a very good platform where one can see what has changed in two years ago and where the industry is heading towards. With every edition, Labelexpo is becoming more and more relevant for the industry,” Ganeshan MV concluded.